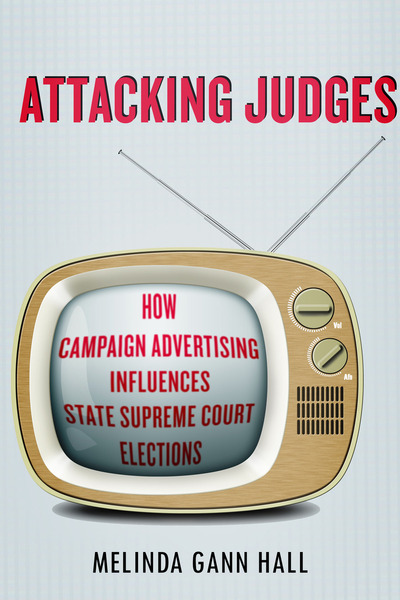 ATTACKING JUDGES: HOW CAMPAIGN ADVERTISING INFLUENCES STATE SUPREME COURT ELECTIONS, by Melinda Gann Hall. Stanford: Stanford University Press, 2015. 264pp. Cloth $90.00 ISBN: 9780804787956 Paper $27.95 ISBN: 9780804793087. With the publication of ATTACKING JUDGES: HOW CAMPAIGN ADVERTISING INFLUENCES STATE SUPREME COURT ELECTIONS, Melinda Gann Hall provides valuable new empirical evidence regarding the effects of judicial elections on the electorate and the judiciary. Hall demonstrates that state supreme court elections have a great deal in common with legislative and executive elections, even (especially) when judicial candidates are the subjects of attack ads. In the first chapter, Hall provides thorough coverage of the legal and political backdrop against which judicial elections occur and the scholarly literature. The literature review includes key points from the political science literature on negativity in American politics. The public does not like attack/issue ads, yet they seem to work because they provide more information than positive advertisements. Hall explains the informational limits of traditional judicial campaigns, which usually emphasize experience, values, and temperament. She also reviews the expansive condemnation of United States Supreme Court’s ruling in REPUBLICAN PARTY OF MINNESOTA V. WHITE (2002), which freed judicial candidates from state laws that restrict issue-based campaigning. The vast array of ills that are purported to flow from this decision include problematic alliances between candidates and interest groups, damaged perceptions of fairness and due process, and a loss of judicial legitimacy. Chapter 2 of ATTACKING JUDGES, provides a historical perspective of judicial selection that traces the transition from appointment to partisan and nonpartisan election to merit selection. The remainder of the second chapter presents the first of Hall’s empirical evidence. These discussions provide pre- and post-WHITE comparisons for electoral contestation, incumbent defeat, and ballot roll off. According to Hall, opponents of judicial elections, and the WHITE decision in particular, allege that electoral contestation will increase, incumbents will be defeated more often or lose vote share, and ballot roll-off will increase as a result of the WHITE decision. The time series data suggest either little change over time or the continuation of trends in place before the WHITE decision. Analysis of variance results show statistically significant differences on incumbent defeat, incumbent vote share, and roll-off post-WHITE, but only in partisan elections. These results are opposite the expectations that Hall associates with critics of judicial elections. Chapter 3 turns to campaign advertising. While data limitations mean there is no systematic evidence prior to 2002, Hall draws on other scholars to demonstrate that nasty campaigns, even those involving televised advertisements, are not a product of the post-WHITE era. Hall’s systematic data from 2002 to 2008 demonstrate that the proportion of contested races with television advertising increased approximately 50 [*23] percent between 2002 and 2004. Televised advertising remains the norm, though Hall notes that Kritzer (2015) documented a slight decrease in 2010 and 2012. The three categories of advertisements used throughout the balance of the book include “promote” ads, which focus on the candidate they were meant to support without mentioning the opponent. “Contrast” ads draw comparisons between the two candidates, and “attack” ads focus (negatively) on the opponent. As noted above, the proportion of contested races involving television advertising jumped between 2002 and 2004 and almost all of these races relied on promote ads, in fact, many relied exclusively on promote ads. Contrast and attack ads appear in fewer races and the data do not show a substantial jump in the use of either of these types of ads even though television advertising increased. The only way the WHITE decision led to a spike in the number of races with negative advertising, would be if that spike occurred immediately in 2002, thus escaping notice in the available data. The rest of the book focuses on the number airings of different types of ads. Chapter 4 presents multivariate analyses of the relationships between airings and incumbent vote share. Chapter 5 uses ballot roll-off as the dependent variable. Both chapters offer multiple model specifications aimed at ruling out alternative explanations or criticisms of misspecification. The models in Chapter 4 consider promote, contrast, attack airings, and campaign spending separately for each incumbent and challenger. Some models rely on counts and others on net differences but the results are robust regardless of model specification. The models include variables that closely parallel those included in Bonneau and Hall (2009) including candidate centered variables such as the margin of victory in the previous election, whether the incumbent is a new appointee, and whether the challenger has judicial experience. Hall also includes institutional variables such as the degree of professionalization, whether elections for that court have historically been competitive, and most importantly, whether the ballots are partisan or nonpartisan. Hall interacts the ballot type variable with the different types of advertisements. The institutional and candidate centered variables perform in much the same way they have in previous research. Newly appointed judges and incumbents facing qualified challengers are more electorally vulnerable, while judges serving on professionalized courts are less so. Quality challengers reduce vote share for incumbents and campaign spending matters. Promote airings have a positive effect for incumbents but no effect for challengers. Contrast ads are not statistically significant for either candidate. The most important finding is that attack airings against the incumbent influence the incumbent’s vote share but that result is conditioned by the type of ballot: attack airings increase incumbent vote share in partisan elections and decrease that vote share in nonpartisan elections. “Ironically, nonpartisan elections may enhance the linkage between citizens and the bench, a result wholly inconsistent with reform advocates’ goals for these elections” (p. 124). Hall demonstrates that institutions matter and not always in the way the designers of the institutions intend. Chapter 5 explores ballot roll-off. Drawing again on the foundations established in Bonneau and Hall (2009) concerning candidate characteristics and institutional context, Hall introduces variables for attack airings, promote airings, and contrast airings [*24] and interacts them with ballot type. Contrast airings reduce ballot roll-off regardless of ballot type and promote airings have no effect. Attack airings in nonpartisan races reduce ballot roll-off but attack airings in partisan elections had no significant effect on ballot roll-off. On average, ballot roll-off is higher in nonpartisan elections. Thus, evidence is quite strong that attack ads fill in information that is lacking in nonpartisan elections-making them more like partisan judicial elections. ATTACKING JUDGES makes several significant contributions to our scholarly understanding of state supreme court elections. First, it demonstrates that judicial elections, even (or especially) those involving attack ads, are much more like legislative and executive elections than previously thought. Research shows that incumbent legislators and executives are largely immune from the effects of attack advertising and Hall demonstrates that incumbent state supreme court justices are similarly immune—as long as partisan labels appear on the ballot. Partisan judicial elections operate much like other contested partisan elections but nonpartisan judicial elections are substantially more sensitive to the messages contained in attack ads. Second, ATTACKING JUDGES demonstrates that attack advertising has no effect on ballot roll-off in partisan elections and actually decreases ballot roll-off in nonpartisan elections. If ballot roll-off is seen as a negative, then attack ads are a net wash in partisan elections and a net gain in nonpartisan elections. Finally, ATTACKING JUDGES affirms findings presented in much of Hall’s earlier work; partisan and nonpartisan elections have different implications for how voters react. Thus, some of the findings are revelatory and some of them are confirmatory. All of them are valuable. A weakness of the book is that the connections between the normative critiques and the empirical indicators are not always clear. Additionally, the normative and practical critiques of judicial elections are not clearly delineated. Throughout the book, Hall draws extensively on normative criticisms from the opponents of judicial elections. For example, Hall quotes the National Center for State Courts as noting that “judicial election campaigns pose a substantial threat to judicial independence and impartiality, and undermine public trust in the judicial system” (p. 131). This charge and many of the others quoted the book seem to be talking about difficult to measure or observe notions of judicial legitimacy and Hall is careful to note the scholarship of Gibson (2012) and others that tackles this inquiry. Yet, it is less clear whether the hypotheses explored in the book flow from these normative concerns or from more practical critiques of how judicial elections operate. Regarding the empirical connection between normative critiques and empirical evidence, how do incumbent losses reflect damaged trust in the courts? Do critics of judicial elections argue that incumbents should be immune to electoral losses or do they argue that the very process that subjects some incumbents to losing and others to winning is what damages legitimacy? Regarding the distinction between normative and practical critiques, how does ballot roll-off reflect normative considerations among voters about whether judges should be elected? Do critics suggest ballot roll-off reflects non-participation protests because of legitimacy concerns or does it simply reflect ill-informed voters? If it is the former, then one would expect voters to be more turned off by the presence of attack ads but if ballot roll-off is a function of ill-informed voters, it [*25] is not surprising that attack advertising fills that informational void--especially in nonpartisan elections. Thus, while the empirical work is both careful and compelling, it may do more to challenge the practical critiques than the normative critiques of judicial elections. Even if the connections to normative critiques are not as clearly developed as they might be, ATTACKING JUDGES is well-written and well-researched. It demonstrates, thoroughly and convincingly, that negative advertising fills significant informational voids for the electorate in state supreme court elections. It provides ample evidence that state supreme court elections are very similar to legislative and executive elections not just regarding attack advertising, but also campaign spending, challenger quality, and other institutional factors. Bonneau, Chris W. and Melinda Gann Hall. 2009. IN DEFENSE OF JUDICIAL ELECTIONS. New York: Routledge. Gibson, James L. 2012. ELECTING JUDGES: THE SUPRISING EFFECTS OF CAMPAIGNING ON JUDICIAL LEGITIMACY. Chicago: University of Chicago Press. Kritzer, Herbert M. 2015. JUSTICES ON THE BALLOT: CONTINUITY AND CHANGE IN STATE SUPREME COURT ELECTIONS. New York: Cambridge University Press.